The early years of aviation were marked by flimsy, unreliable machines and daring adventurous young men. One of the pioneer aviators leading the way in Britain was F. Warren Merriam who, following Louis Blériot’s first flight across the Channel in 1809, joined the Bristol and Colonial Aeroplane Company through which he obtained a Royal Aero Club’s aviator’s certificate. Much of the flying training in those early days was a case of the blind leading the blind and, as Merriam wrote, ‘Flying was a dangerous business then. Airplanes were constantly breaking up in the air – let alone on takeoff and landing; there were no parachutes and the pilots were ever expectant of mishaps.’ This was hardly the career for a decent young man and for a long time he had to keep his flying a secret from his parents. Aviation did indeed develop into a career, with Merriam becoming a certified instructor at Brooklands aerodrome. There he taught many of the men who became pioneers in aviation and others who joined the Royal Flying Corps that crossed to France in the early months of the First World War. The term pioneer could also be ascribed to Merriam for he was the first person in Britain to fly through the clouds. Until that day in 1912, it had been assumed that pilots would always stay within sight of the ground. Why would anyone want to go so high? 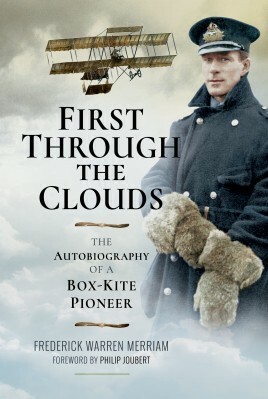 This entertaining autobiography takes the reader on a journey through Merriam’s early flying career, from how it started through his first ‘shaky’ solo, through a series of crashes into his First World War service. His account is the story of the early history of aviation, the development of aircraft and the personalities that led the way in those exciting, if risk-strewn days of yore. Frederick Warren Merriam was born Frederick Warren but changed his name by deed poll in 1901 to Merriam after being befriended and sponsored in his flying aspirations by an American, Olin Merriam. At the controls of a Bristol Box-kite, in 1912 he was the first pilot in Britain to fly through cloud. Later, as manager and chief instructor of the Bristol Flying School at Brooklands, he had many pupils who subsequently became famous. At the outbreak of the First World War Merriam was the most senior flying instructor in Britain; he duly became chief instructor to the R.N.A.S. at Hendon and later at Chingford. In 1922 he founded Britain’s first gliding school, near Shanklin, Isle of Wight. It was only the toss of a coin at the Royal Aero Club which decided that Alcock, rather than Merriam, should accompany Whitten-Brown on the first direct transatlantic flight. Forever linked with the earliest days of British aviation, Merriam died at Christchurch, Hampshire, on 12 November 1956 at the age of 76.